Mike Richter won almost every conceivable individual and team honor during his 14-year NHL career. Even in retirement, the Abington, Pa., native continues to earn accolades for his on-ice efforts. The latest honor for the former New York Rangers goaltender is the Lester Patrick Trophy for outstanding service to hockey in the United States. Also honored during a reception at the Gotham Hall in New York on Oct. 21 were former Rangers teammate and Hockey Hall of Fame center Mark Messier and Detroit Red Wings Senior Vice President Jim Devellano. One of the greatest big-game goaltenders of his era, Richter backstopped the Rangers to the 1994 Stanley Cup and led the United States to the inaugural World Cup of Hockey title two years later. 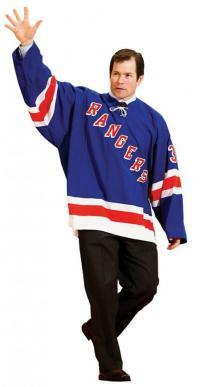 Richter’s 666 games played and 301 victories are the most by a goaltender in Rangers history. His 42 victories in 1993-94 are a team single-season record. He was a three-time Olympian who won a silver medal with Team USA in Salt Lake City in 2002. His No. 35 jersey was retired by the Rangers on Feb. 4, 2004, and he was inducted into the U.S. Hockey Hall of Fame on Oct. 10, 2008. The Lester Patrick Trophy was presented to the NHL by the Rangers to honor the memory of Lester Patrick, who spent 50 years in hockey as a player, coach and general manager and was a pioneer in the sport’s development. Bob Klem is a staple at Kansas City ice rinks. Even at 55 years of age, Klem plays at least three games a week as a goaltender for teams in two recreational leagues. Friends and fellow players joke about when he’ll hang up his skates, but he insists it won’t happen any time soon. At least not until a viable treatment can be found for pancreatic cancer. In November 1999, the father of two lost his best friend and wife, Becky, to pancreatic cancer. There are no warning signs or means of detecting the disease until it is too late. Becky’s cancer was allowed to spread for three to five years before she was diagnosed. She passed away three months later. A supporter of NHL Fights Cancer, Klem wrapped his goal sticks in pink tape to show support and serve as a reminder of his biggest fan. A while later, his daughter suggested he add purple tape, representing pancreatic cancer, to his stick. “I thought, tape is nice and all but what does that do?” Klem said. Klem looked for ways to fight pancreatic cancer and decided to start donating to the Pancreatic Cancer Action Network based on his hockey participation. In 2007, Klem decided to donate $10 for every win he had in November, which is Pancreatic Cancer Awareness Month. When he told his teammates what he was doing, they donated as well, raising $2,200. The next year his daughter Rachel suggested he expand fundraising beyond individual donations to a charity game. This time it wasn’t just Klem and his regular teammates pledging money, but players from each of the three leagues in Kansas City. 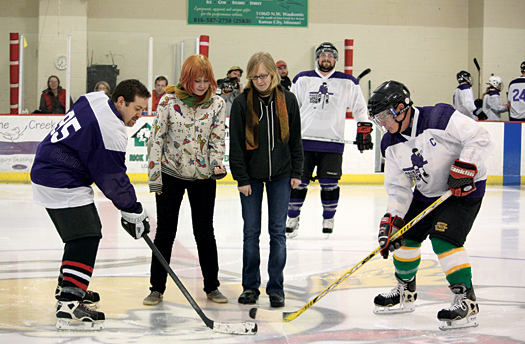 The game and competition was such a success it raised $6,700. But Klem hopes the second annual game will raise even more money. Through the charity games, Klem and his family hope to raise awareness of pancreatic cancer while keeping Becky’s memory alive. Chris Drury has registered more than 300 assists in the NHL, but none bigger than the one he provided to the Southern Connecticut Storm. To learn more about ASHA or find a program check out Hockey is for Everyone at NHL.com. The Trumbull, Conn., native recently invited members of the special hockey team to be his guests at the Rangers Practice Facility for a private camp. The Storm are one of 50 special hockey programs that have popped up around the country since the American Special Hockey Association was formed in 2005. One key to ASHA’s growth has been its ability to join forces with several NHL teams and players, such as Drury. It’s latest step has been to join the NHL’s Hockey is for Everyone initiative, which works to provide support to organizations offering people of varying backgrounds the chance to play hockey. ASHA, along with USA Hockey, has been working to create opportunities for people with physical and mental disabilities to learn the game of hockey. Members of ASHA programs range from those with autism and Down syndrome to cerebral palsy. ASHA President Mike Hickey acknowledged that at first there was apprehension in starting a special needs program involving skates, sticks and flying pucks. However, the programs have proved to be safe, fun and therapeutic for the participants, encouraging self-confidence, team play and skill development. In addition to Drury’s personal involvement, NHL clubs including the Columbus Blue Jackets, Pittsburgh Penguins and Chicago Blackhawks have been supportive of their local ASHA programs. Inviting ASHA under the NHL umbrella seemed like the next logical step, said Rob Wooley, NHL’s manager of cause marketing. With the help of the NHL, ASHA will be able to spread the word to potential volunteers and participants and help these programs grow. That voice also includes help with sponsorship and grants to keep special hockey programs running. But more than that, it’s the impact it makes on the players. “For most of the players, having Chris teach, play and skate with them allowed them to show off the skills they have been learning at Storm Hockey, and push themselves even further to show Chris just what they can do,” said Deb McQuilkin, ASHA secretary and president of the Storm. The Cincinnati Icebreakers Sled Hockey program received a gift of 10 new sleds, sticks and sets of hockey gear thanks to the NHLPA’s Goals & Dreams fund. “We are beyond excited to be chosen as a recipient of the NHLPA’s Goals & Dreams fund and receive $10,000 worth of sled hockey equipment,” said Renee Loftspring, founder of the Icebreakers program. The Cincinnati Icebreakers began in 2008 with the goal of providing players ranging in age from 6 to 60 with the opportunity to discover the fun of playing sled hockey at little or no cost. To date, Goals & Dreams has donated more than $17 million to grassroots hockey programs around the world making it the largest program of its kind. For more information on the NHLPA, please visit www.NHLPA.com. 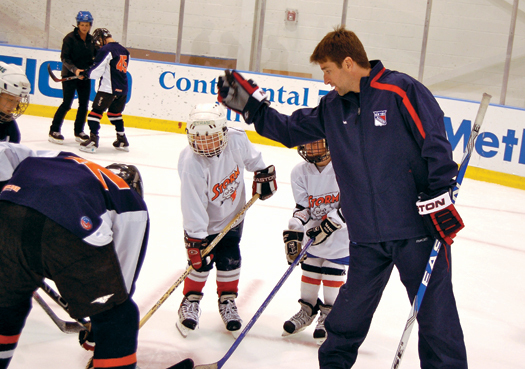 The new hockey season is under way and the process of educating players, parents and coaches on the benefits of the American Development Model continues to pick up steam. To help spread the word, USA Hockey has distributed ADM kits to every youth hockey association around the country. Each kit contains materials that explain the details of this revolutionary new program with specially produced newspapers, a DVD and wristbands for local members to show their support. Each association is asked to distribute the newspapers and arrange times to show the DVD to coaches and parents to answer any questions they might have about the program. In addition, ADM regional managers are fanning out across the country to meet with as many District, affiliate and local associations as possible to share ideas on how ADM principles can be incorporated. For more information about the ADM kits or to arrange a visit from the ADM regional manager in your area, contact Ken Martel, director of the ADM, at kenm@usahockey.org.